Home » Articles » Things To Do » Witness the Biggest Pro Boxing Event in Quad Cities This Weekend! Witness the Biggest Pro Boxing Event in Quad Cities This Weekend! The biggest pro boxing event in the Quad Cities in over 20 years is coming to the Rhythm City Event Center! 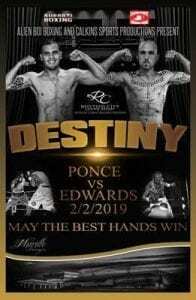 Alien Boi Boxing and Calkins Sports Productions present DESTINY Live professional Boxing at Rhythm City Casino (7077 Elmore Avenue Davenport) this Saturday Feb 2. Doors open at 5:30 p.m. and fight starts at 7 p.m. This is an all ages event. Don’t miss this unforgettable night, as Limberth Ponce 16-3 (10) challenges “Stunning” Stephen Edwards 10-0-1 in an 8 round main event battle for the Iowa State Junior Middleweight Championship. Limberth Ponce from Rock Island, IL is 16-3 with 10 knockouts and has been a fan favorite in the Quad Cities since his pro debut in 2012 with is exciting aggressive style. Ponce an outstanding amateur boxer won the 2012 Chicago Golden Gloves Championship before his professional career that has seen him perform on ESPN and CBS Sports Network. Stephen Edwards from Davenport, Iowa is undefeated as a pro 10-0 with 1 draw and has a huge following of QC fans that have seen him win the Continental Boxing Association Super-Middleweight title along with the Mid-American Middleweight Championship. Edwards also operates Stunning Boxing Club in Davenport teaching the youth fundamentals of boxing and life. Both fighters are undefeated in the Quad Cities with Edwards winning 7 fights in the QC and Ponce being victorious in 11 bouts. Someone’s “0” has got to go! An exciting under card featuring East Moline’s “Smokin” Joe Perez 13-3-1, Rock Island’s Eddie Hamilton 4-0, Davenport’s Shawn West 2-0, Joe Munoz and Randy Meade of Davenport. and an exciting Female bout featuring the debuts of Davenport’s Kristine Iron-Rood and Julie Guiste of Galesburg, IL. Alfredo Cervantes of Sterling, IL will be making his pro heavyweight debut. Cervante’s wife Angelica suffers from Huntington’s disease and Alfredo’s goal is to have his pro boxing career help him with his mission to finding a cure for his wife’s disease. Those bouts plus more coming to Rhythm City Casinos great night of fights. Ringside Tickets $75. Reserved 2nd Row $55. Reserved 3rd and 4th Row $40. General Admission tickets are $25 plus tax and an online/phone ticketing fee (this fee is waived when tickets are purchased at The Market inside Rhythm City Casino). Purchase your tickets today at https://rhythmcitycasino.showare.com/ordertickets.asp?p=48&src=eventperformances. Don’t miss out on a great night of fights!